Starting a Kia Sorento is an adventure taken in style. Starting a family is an adventure. Many might say it is the greatest adventure of your life. It’s a journey that we take with our children from birth until we die so why shouldn’t it be taken in style. Enter the Kia Sorento. When I think of starting a family, like most parents, I think of it as a great blessing but at the same time it’s a time of great sacrifice. The saying that a baby changes everything is the truest statement ever made. It does and it usually starts with the car you drive. It’s a little difficult driving around town with a kid in a cool two-seater. 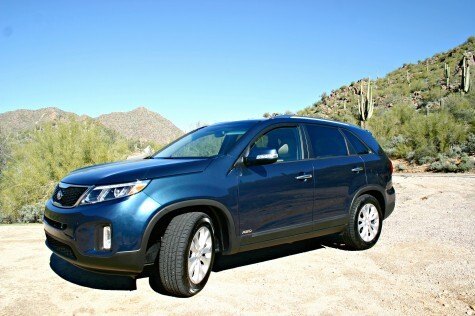 The 2014 Kia Sorento lets you take the journey of parenthood in style, high tech and affordability. You might have to sacrifice your sports car for something to keep the twins safe in but that doesn’t have to mean that you have to sacrifice all style and sophistication. Kia has made safety a priority in this vehicle because they know that you are carrying around the most precious cargo of all but they have also made it pretty freaking cool. The interior has anti-static and anti microbial qualities, which is great for little hands that stick everything in their mouth, and then promptly drop it to the floor. It has a stronger, safer body design and fast-response AWD system. It also has a blind spot detection system to help protect you from any unforeseen accidents while dropping off and picking up the kids from school. Let’s face it we don’t always check the blind spot as well as we ought to, sometimes there’s dry cleaning hanging right there or when you’re up a little high some teeny Miata-like-thing will merge next to you in total stealth mode. Blind spot detection systems are a godsend. The 2014 Sorento also has a programmable power liftgate, which is great when unloading packages in the garage, especially if you have a low ceiling and are distracted by little people running off in all directions. This means that if you have a height restriction you can set the liftgate to open only to a given height so it won’t pop up and hit the top. Also if you’re really tall you can have it open up higher each time so you’re thunking your head less often. My husband is 6’5″ and this is a feature that he loves. Speaking of style that the whole family will enjoy; it has built in 2nd row sunshade blinds to protect little eyes from the bright sun while napping on the road and a new panoramic roof which provides endless hours of name that cloud entertainment for the toddler set. It also has 5-speaker premium Infinity sound system, so you can blast Yo Gabba Gabba to get the sillies out or Fun to remind yourself that you are still young enough to take this car out for a spin in the mountains. The new design is technologically advanced; this is not the station wagon our parents were doomed to once they had kids. 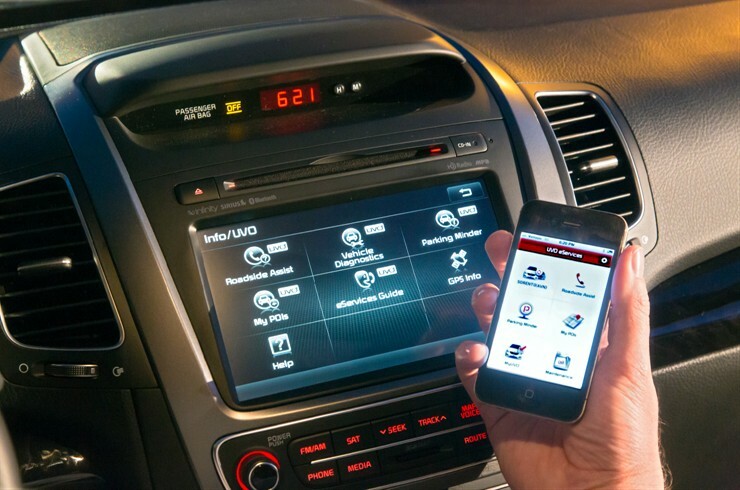 The optional console screen is eight inches and integrates navigation, SiriusXM Traffic with real-time road information updates, SiruisXM Satellite Radio, Bluetooth hands-free connectivity, vehicle settings and UVO eServices. Who says you can’t have kids and still be cool? 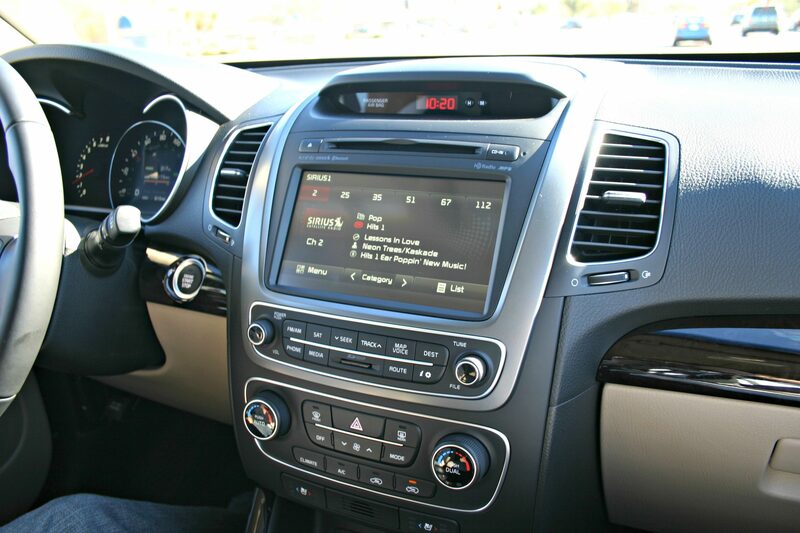 A fully loaded Kia is a shockingly luxe vehicle with everything the big boys offer including heated and cooled seats. With three rows of seating there is plenty of room to expand your family or pile in and head out for a family road trip that none of you will ever forget. 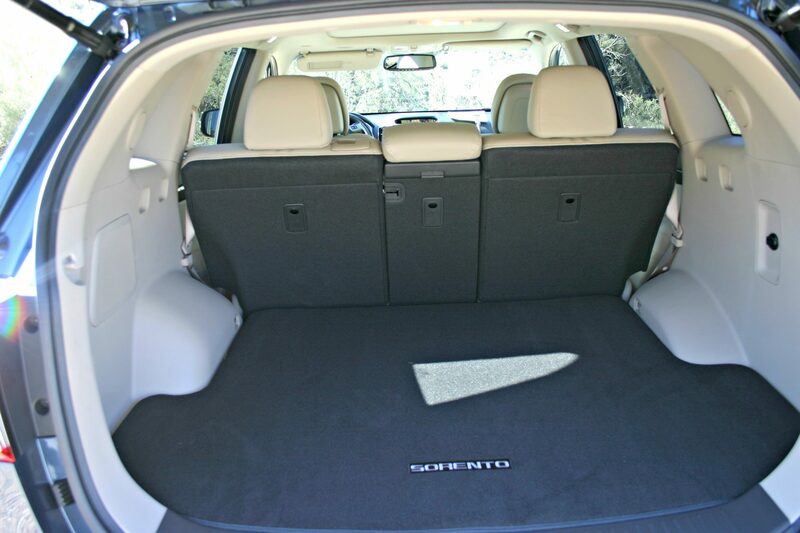 With the 2014 Kia Sorento, you can make your family journey as exciting as the destination. The UVO interface is going to need a blog post of it’s own. You can find Debi blogging at The Truth About Motherhood or follow her on Twitter. And here are some comparison stats including the two engine models. The four cylinder (hello city driver!) with 191 horsepower and the six cylinder which boasts 290 hp. The four cylinder version has 181 lb. ft. of torque at 4,250 rpm and the six boasts 252 lb. ft. of torque at 5,200 rpm. If all you can afford is the four cylinder version I’d highly recommend not test driving the larger engine as those numbers are far enough from each other that you might experience some disappointment in the power going from 6 to 4…. or you could go ahead and embrace The American Way and buy a car you can’t quite afford. I’m not here to judge. Here’s a little comparison sheet on three of the 2014 Kia Sorento Specifications.